In a somewhat unprecedented move, Vice President Mike Pence followed in President Donald Trump’s footsteps by attending the 2018 Values Voters Summit in Washington, DC. The annual evangelical event is spearheaded by anti-LGBTQ group Family Research Council (FRC). The Values Voters Summit is sponsored by the American Conservative Union, the NRA, and the FRC. The FRC has been designated a hate group by the Southern Poverty Law Center. Pence may have accepted the speaking engagement as an opportunity to fire up Christian conservative voters before the 2018 midterm elections. Up until now, no other sitting vice president has attended the conference. Will the evangelical GOP rally behind their own? Tony Perkins, president of the FRC, seemed to believe they should. “He has systematically followed through on his promises, whether it is rebuilding our nation’s military, whether it is restoring religious freedom in the country,” Perkins said at the conference. The FRC is backing Trump in a major way by launching a 12-state bus tour that will build up to a 90-minute national simulcast event the Sunday before the election. Organizers plan to discuss key issues and partake in group prayer. 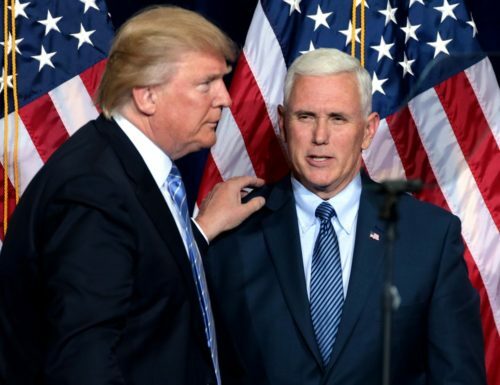 Pence was credited with helping to convince evangelical Christians to back Trump’s presidential bid and, some might argue, could be the key to rallying the troops for Trump. What else could be expected from the man who believes God told him he’s the “president-in-waiting,” after all? A full list of speakers at the 2018 Values Voter Summit is available. Notable names include Michele Bachmann, former Superman star Dean Cain, Senate Majority Leader Mitch McConnell, and Secretary Mike Pompeo.